We are passionate about fine art. Founded in 1994 Galeria Aniela w on the trust of some of the most important Australian Artists from post WWII until today. 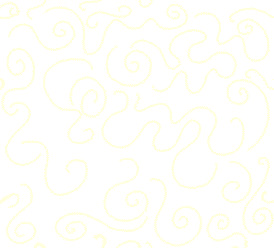 We challenged the status quo from its inception o ffering top-quality fine art outside the metropolitan area for public display and acquisition , built a reputation in Australia and the wide World . Recognizing the importance of the buyer confidence in securing authentic art, we provide an opportunity to purchase museum-quality original artworks of impeccable provenance from significant artists Arthur Boyd, Jamie Boyd, Lenore Boyd, Charles Blackman , Garry Shead , John Olsen, John Perceval, Lily Kelly Napangardi , Minnie Pwerle, Nancy Nunguarrayi , Ningura Napurrula, Nyurapayia Nampitjinpa aka Mrs. Bennett and many more. John de Burgh Perceval is one the most important Australian artists from post-WWII up until today. Perceval made a strong impact v irtually as soon as he had begun in 194 2 in Melbourne at the Contemporary Art Society of Victoria . By the 60's Perceval developed an unique individual style achieving artistic acclaim and great financial success. 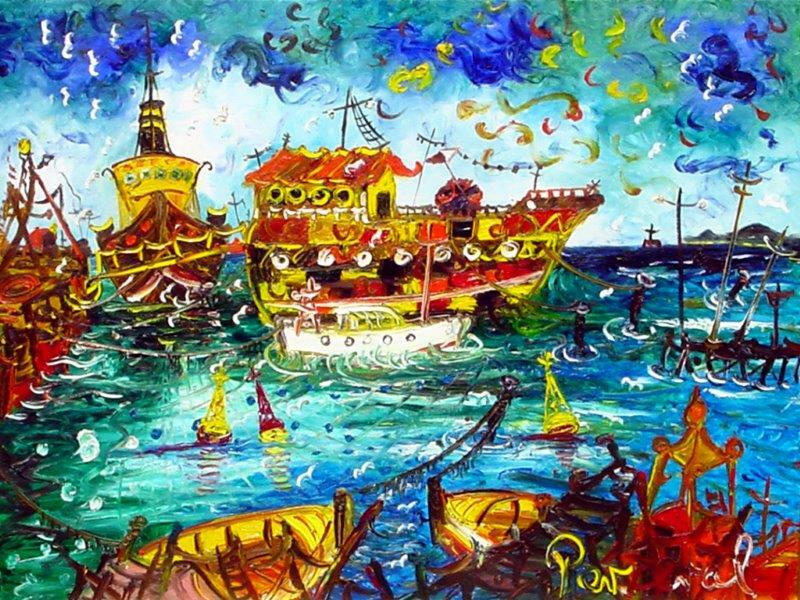 John Perceval painting 'Sulphur Smoke' Williamstown series sold for $589,000 , the highest price for a living Australian artist (2000) T he Australian . 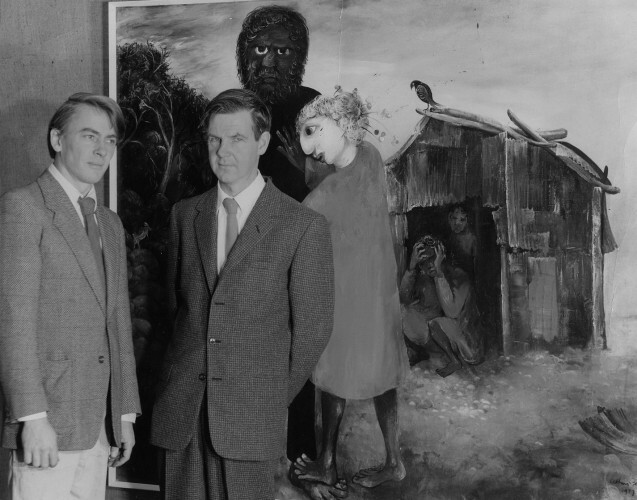 PHOTO (1968) : John Perceval and Arthur Boyd often painted 'en plein air' for the freshness and clear tone of works being painted outdoors. 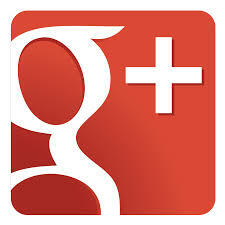 John de Burgh Perceval was born 1 February 1923 in Western Australia at Bruce Rock, Western Australia . Perceval birth name is Linwood Robert Steven South. He was the second child of Robert South and Dorothy née Dolton. Perceval parents separated in 1925. Perceval remained at his father's farm until reunited with his mother in Melbourne in 1935. Following the marriage of his mother to William de Burgh Perceval, he changed his name to John and adopted the surname de Burgh Perceval. In 1938 Perceval contracted polio and was hospitalized, giving him the opportunity to further his skills at drawing and painting. 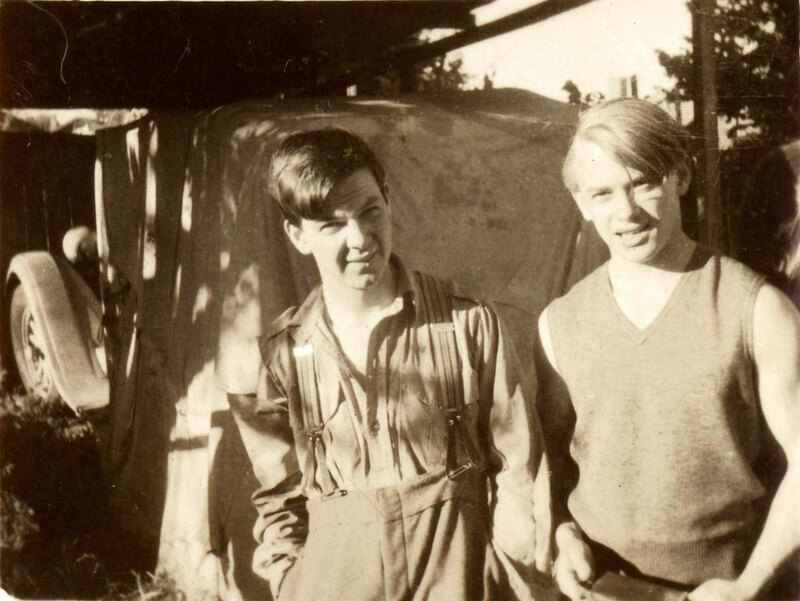 Enlisting in the army in 1941, Perceval befriended Arthur Boyd. After leaving the army Perceval married Boyd's sister Mary in 1944 and moved into the Boyd family home at Open Country, Murrumbeena. They had four children Matthew, Tessa Perceval , Celia Perceval and Alice . Perceval held his first solo exhibition at the Melbourne Book Club in 1948 and showed regularly with the Contemporary Art Society. 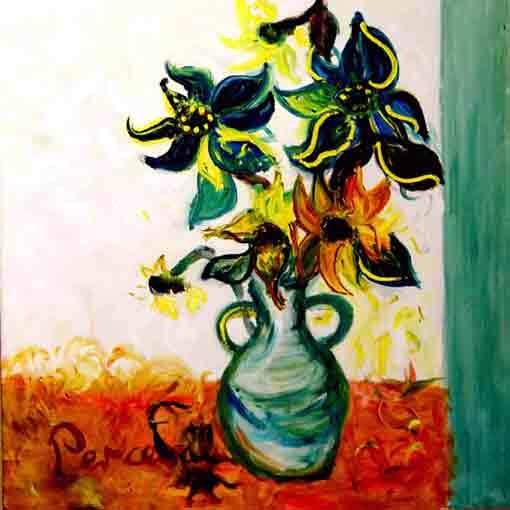 Perceval made an impact v irtually as soon as he had begun to paint in the 1940s, when he exhibited in Melbourne in 1942 at the Contemporary Art Society of Victoria, Australia. By the 50's and the 60's Perceval work had developed into an individual style giving him an artistic acclaim as well as the financial success. Between 1949 and 1955 Perceval concentrated on producing earthenware ceramics and helped to establish the Arthur Merric Boyd Pottery in Murrumbeena. Returning to painting in 1956 Perceval produced a series of paintings of the famous Williamstown series and Gaffney's Creek. Moving to England in 1963 Perceval held solo exhibitions in London, and travelled to Europe, before returning to Australia in 1965 to take up the first Australian National University Creative Fellowship. 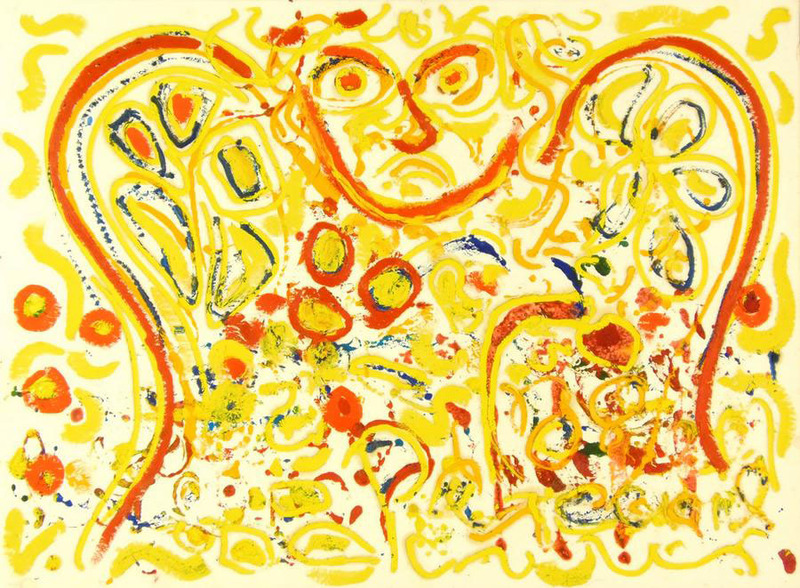 JOHN PERCEVAL played a major role in the Antipodean group in the late 1950's in Melbourne. In 1959 Perceval signed the Antipodean Manifesto which determined the shape of Australian contemporary art. Antipodean group reacted strongly against the promoters of non-figurative painting who followed the trends in the United States and suggested that representational painting was unfashionable and outdated. Perceval was the member of the famous group known as the Angry Penguins who redefined Australian art in the 40s and the 50's. 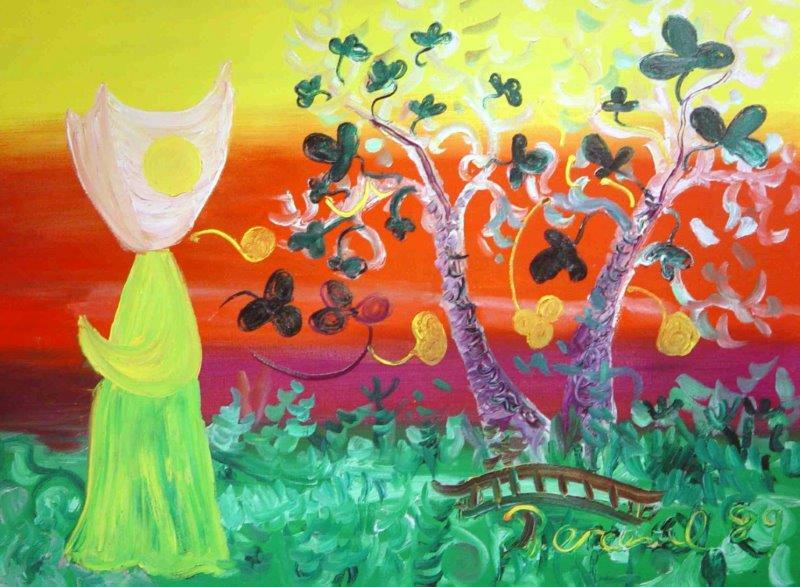 Other members included John and Sunday Reed, Joy Hester, Sidney Nolan, Arthur Boyd and Albert Tucker. 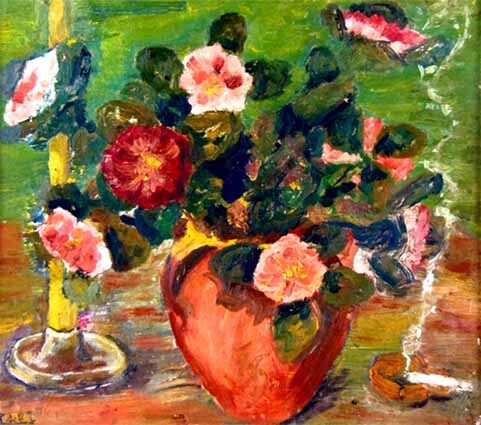 John de Burgh Perceval (1923-2000) is one of the Australia's most important 20th century artists (Australian Painter and Ceramicist ) and remains the best-loved artist. Perceval contribution to important historical group and the development of the contemporary Australian art is significant. All major public and private collections have acquired the representation of Perceval works. With a contribution spanning nearly six decades, John Perceval created a relatively small body of work by comparison with artists like Arthur Boyd and Sidney Nolan , Perceval produced fewer than 600 original oil paintings. (1966) Albert Hall, Canberra held Perceval first major Retrospective Exhibition. (1984) Heide Museum of Modern Art held Perceval Retrospective Exhibition. 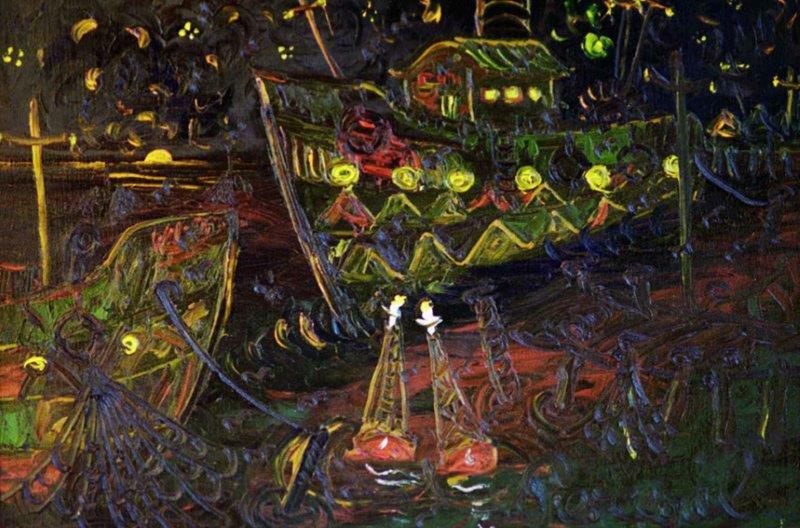 JOHN PERCEVAL, a major retrospective exhibition, was held at Albert Hall, Canberra in 1966. Author Margaret Plant's monograph John Perceval, was published in 1971. Suffering from alcoholism and schizophrenia in 1974 Perceval committed himself to the psychiatric hospital Larundel, Melbourne, where he remained until 1981. JOHN PERCEVAL: A Retrospective Exhibition of Paintings was held at Heide in 1984. 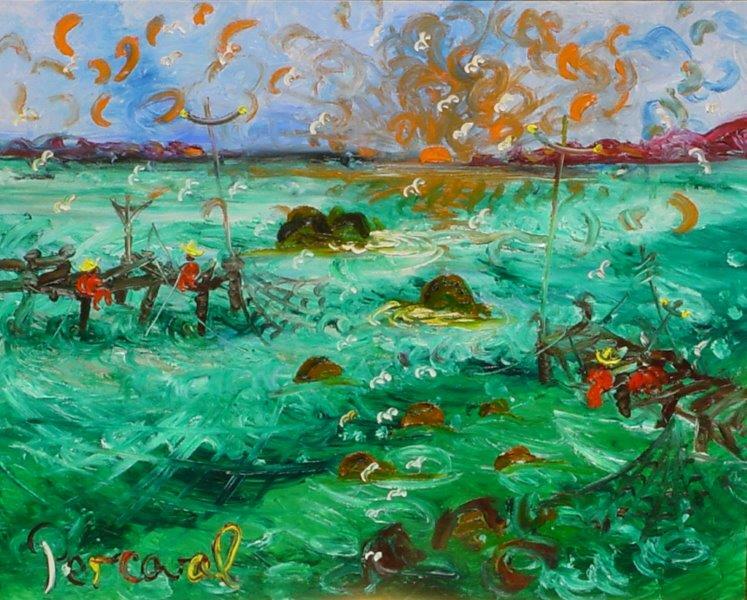 Perceval was awarded Officer of the Order of Australia (AO) in 1991, the year after the National Gallery of Victoria organized John Perceval: A Retrospective. 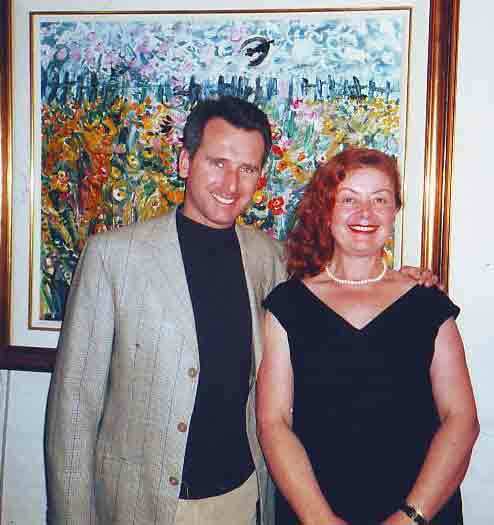 In 2000 JOHN PERCEVAL Retrospective held in Galeria Aniela Fine Art Gallery and Sculpture Park was launched by Chairman Sotheby’s Australia Justin Miller . The exhibition was filmed by the ABC TV Australian National News - VIDEO. 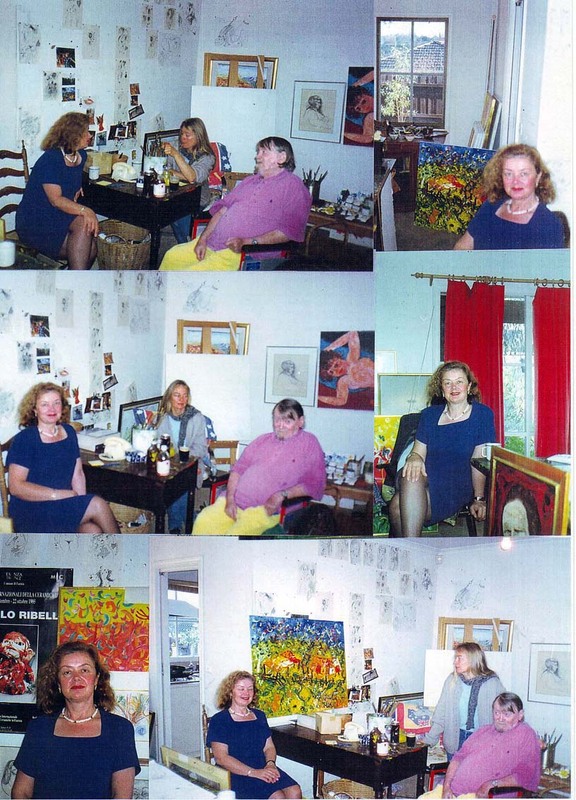 The Retrospective from 19 August to 19 October 2000 was organized with John Perceval personal encouragement and support. 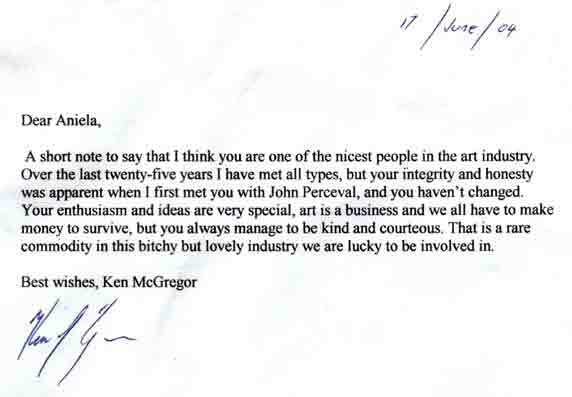 Galeria Aniela express thanks to the artist's Manager Ken McGregor and also the contributing collectors. 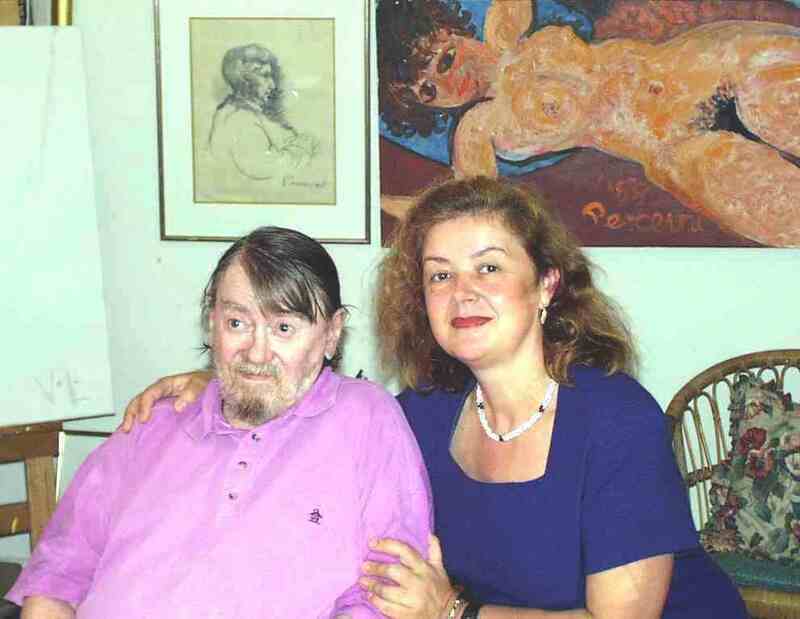 JOHN PERCEVAL Retrospective Exhibition (included 80 oil paintings and works on paper from 1946 to 1999). It was Perceval last Retrospective and shown on the ABC TV Australian National News . 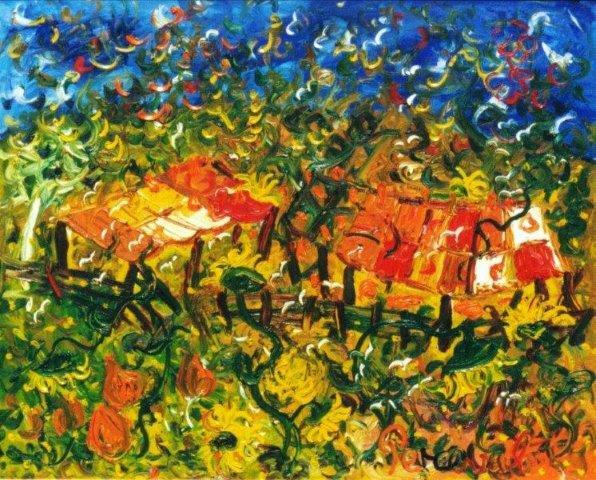 Prior to JOHN PERCEVAL death his painting 'Scudding Swans' (1959) sold for $552,500, it was a record for a living Australian painter. 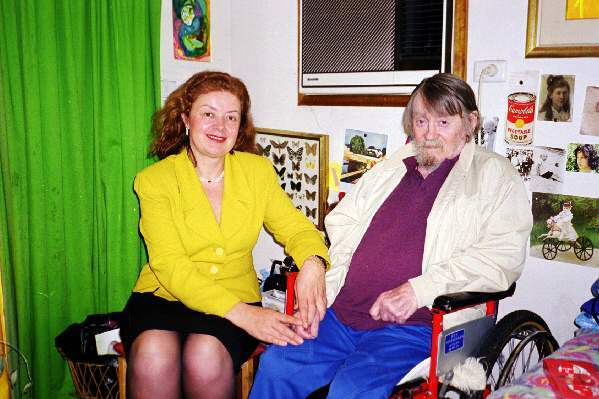 John Perceval d ied 15 October 2000 (aged 77) in Melbourne survived by his four children. 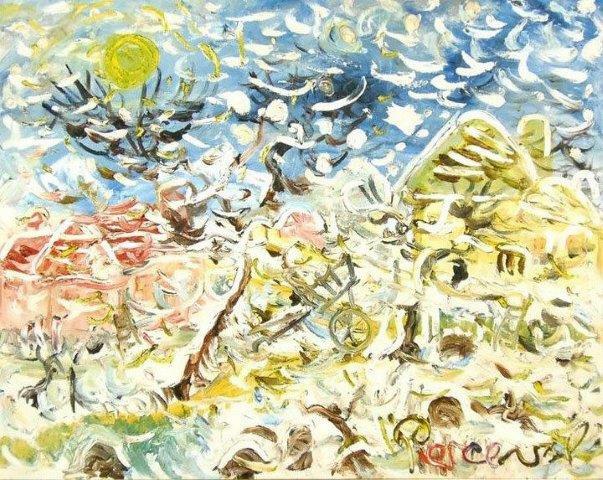 In March 2010 John Perceval painting 'Scudding Swans' sold fo r $690,000. 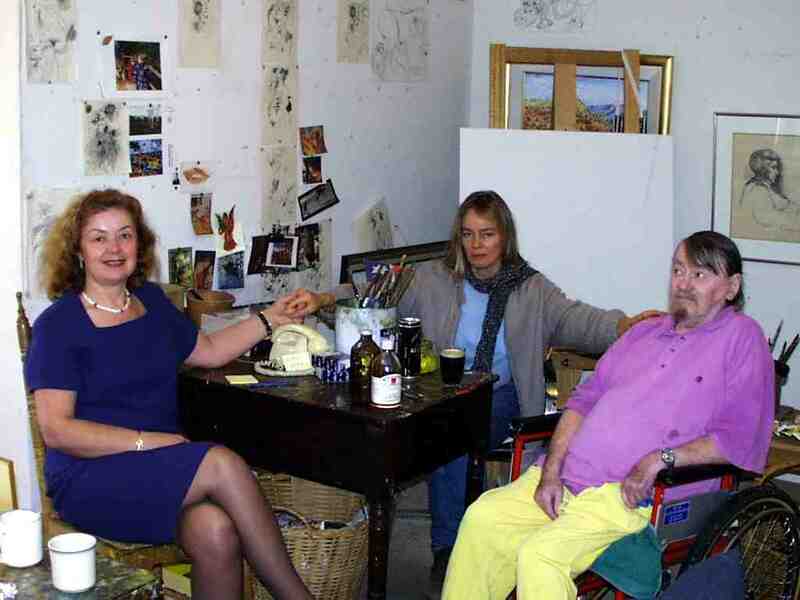 Perceval Retrospective was organized with the artist personal encouragement and full support. Galeria Aniela is far more than a destination for the FINE ART, w e offer an enjoyable experience and educational opportunities to all sectors of the public . Shipping worldwide usually dispatched within 24 hours, delivery in 3-5 business days contact us for shipping assistance or Pick Up from Galeria Aniela. Shipping worldwide usually dispatched within 24 hours, delivery in 3-5 business days contact the gallery for shipping assistance or Pick Up from Galeria Aniela. 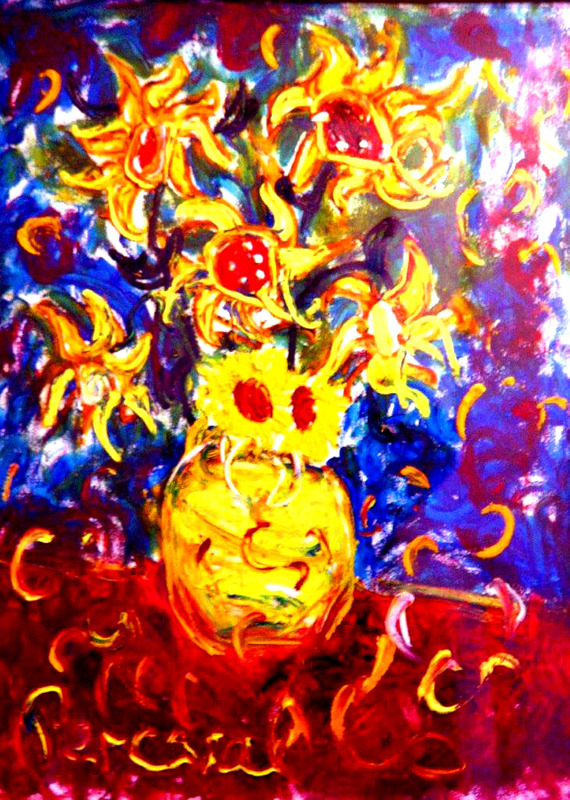 "Sapphire Blue Sunflowers" is a masterwork, it is the only Sunflower painting that Perceval created in the sapphire blue colour. 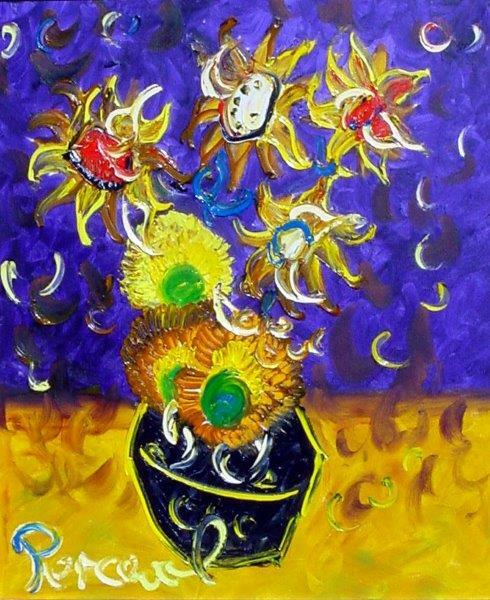 Sapphire Blue Sunflowers is a paraphrase of a very much contemporary work of art, beautifully composition showing the visible power and superb tone with his typical rich paintwork and swirling brush strokes. 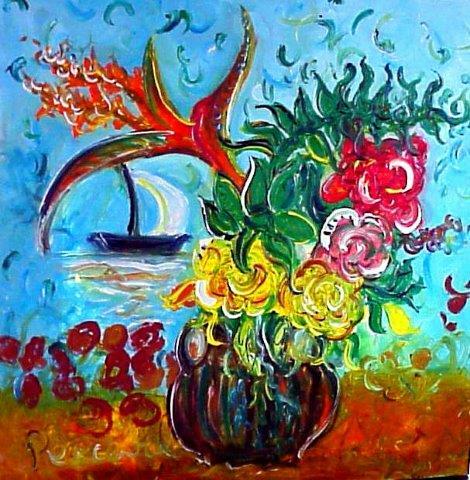 NOTES : A beautiful highly textured painting, superb composition, is Perceval signature painting in typical swirling brush strokes with rich paintwork in his characteristic expressive tone of colour. 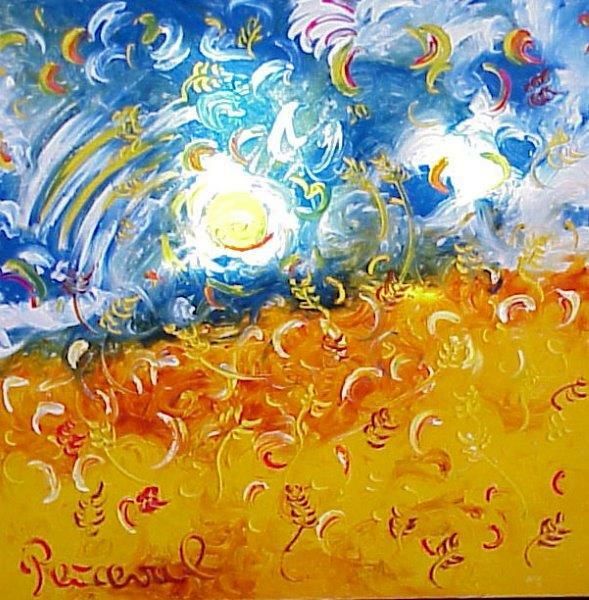 'Sunflowers on Gold' is a masterwork beautifully composition, highly textured rich paintwork in characteristic Perceval expressive clear tone of colour, is a Perceval signature painting with the artist typical swirling brush strokes and warm tones. 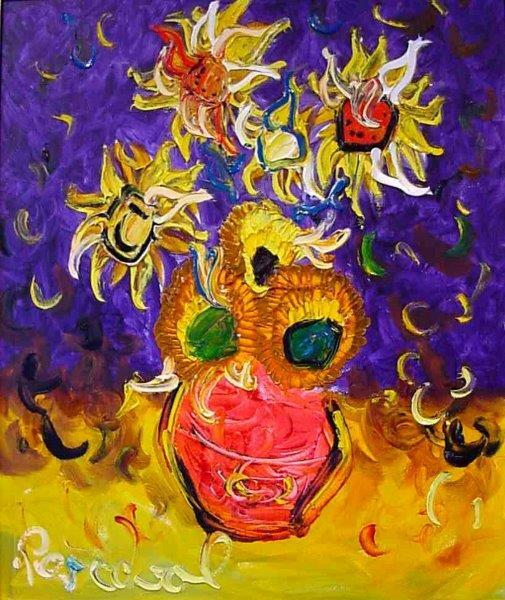 "Free Sunflowers" is a beautiful, rich and highly textured painting with clear and expressive tone of colour . 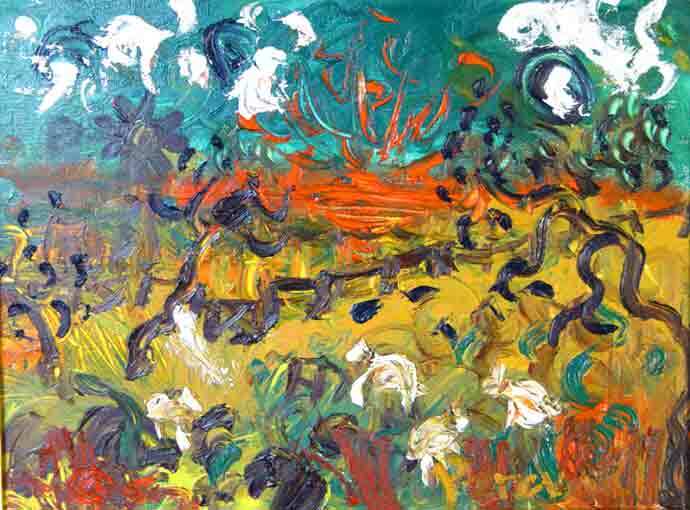 Characteristically Perceval, it is the artist superb signature work with swirling brush strokes and warm tones beautifully composition. 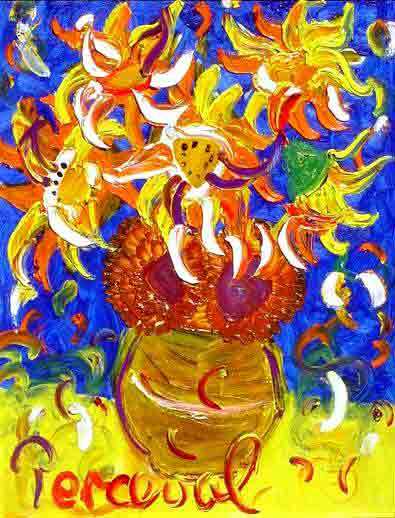 Perceval loved Vincent van Gogh's work and yet, Perceval Sunflowers are free of van Gogh inhibitions allowing the unconscious to come to the fore and releasing new and greater powers. 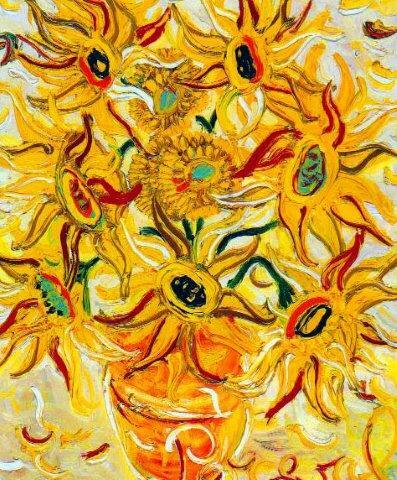 John Perceval Sunflowers come from his most powerful memory from his upbringing was of the golden fields of sunflowers on his father property in Western Australia. 'Free Sunflowers' emphasize Perceval strength as colorist achieving the most hues that can bring about joy. Perceval established very strong emotional connection with Williamstown, a small Melbourne Harbour. 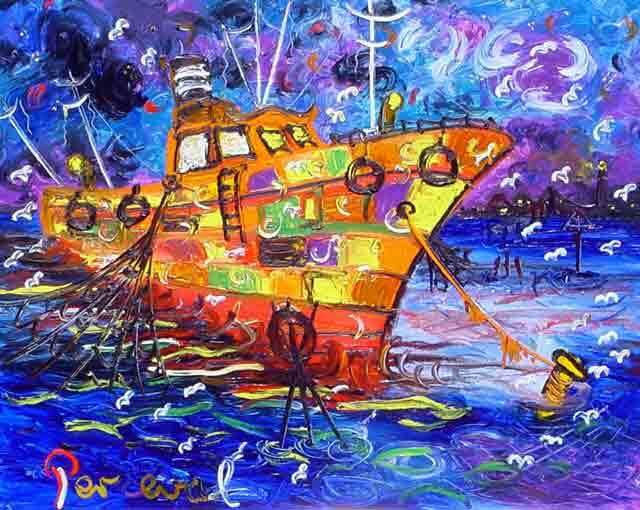 Williamstown paintings formed John Perceval first major show in 1956 bringing the artist an immediate artistic acclaim and financial success. 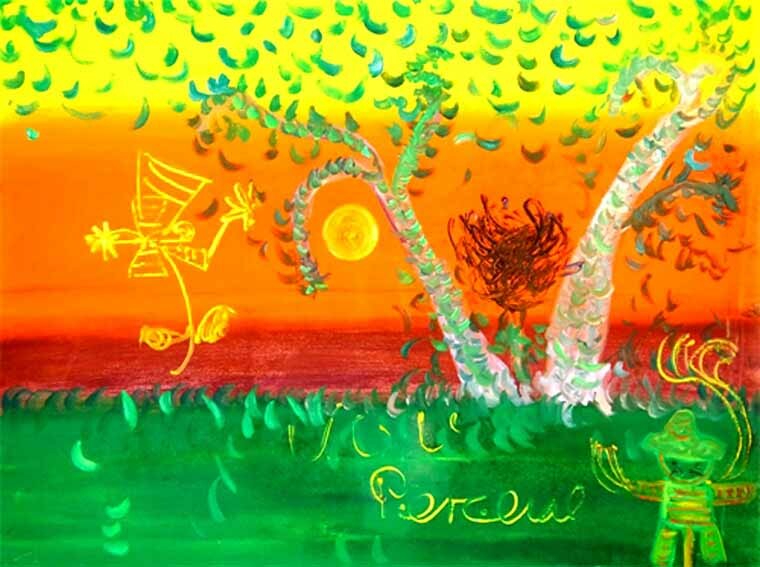 John Perceval was seen to have approached Australian landscape with a new vision motivated and governs by emotions. 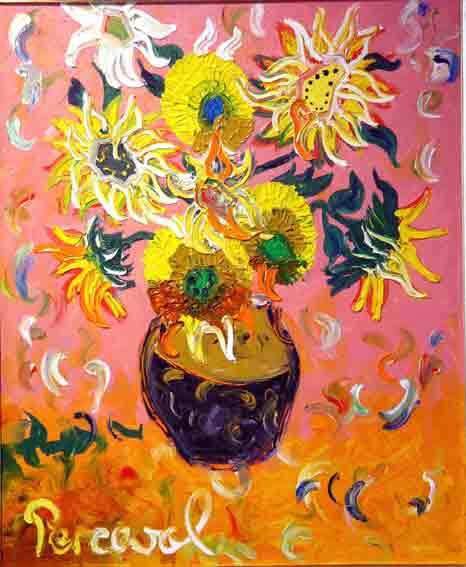 John Perceval early Williamstown paintings are in the prestigious collection of the National Gallery of Victoria (Melbourne) and the Heide Art Gallery (John and Sunday Reed Collection) . 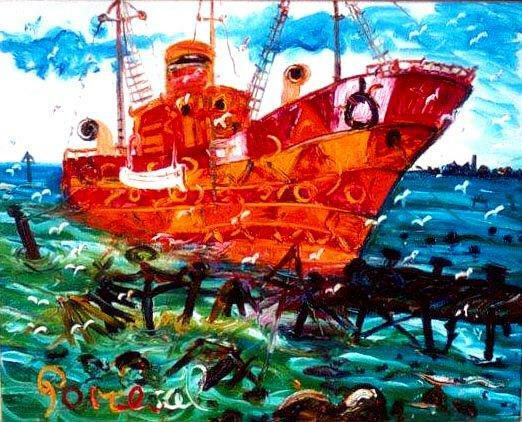 ‘Ships at Williamstown 1988-89’ is the artist's masterwork. The painting is typically Perceval, rich and highly textured body of paint, with exceptional clear tone of colour and great attention to details.
' Ships at Williamstown circa 1988' Williamstown boats become anthropomorphized as their portholes suggest facial expression funnels breathe out smoke, horns sway to their musical sounds and pieces of maritime equipment move in a sea dance of their own and the phenomenon of each boat responding to its own gust of wind and movement of the tide. J OHN PERCEVAL has played a major role in the Antipodean group in the late 1950s in Melbourne and in 1959 he signed the Antipodean Manifesto which determined the shape of Australian contemporary art. Antipodean group reacted strongly against the promoters of non-figurative painting who followed the trends in the United States and suggested that representational painting was unfashionable and outdated. 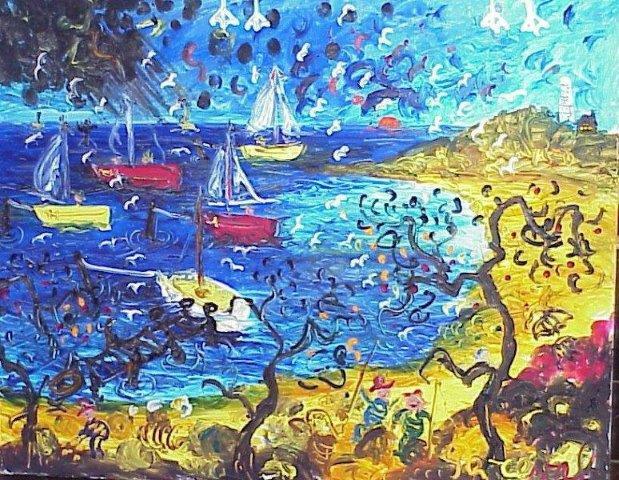 In 30 June 2000 Sotheby's sold John Perceval "Scudding Swans" (Williamstown series) for $552,500 it was then a record for a living Australian painter. 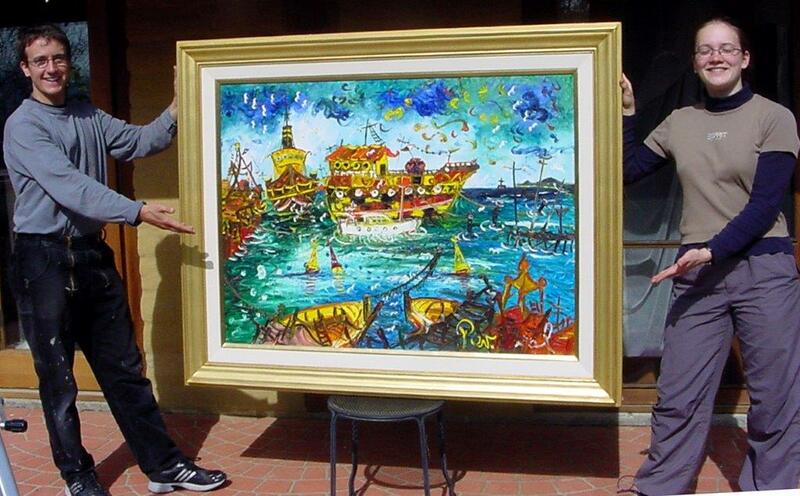 In March 2002 Dutscher Menzies sold John Perceval "Sulphur Smoke" for $596,600. John de Burgh Perceval AO (1 February 1923 - 15 October 2000) was a well-known Australian artist. Perceval was the last surviving member of a group known as the Angry Penguins who redefined Australian art in the 1940s. 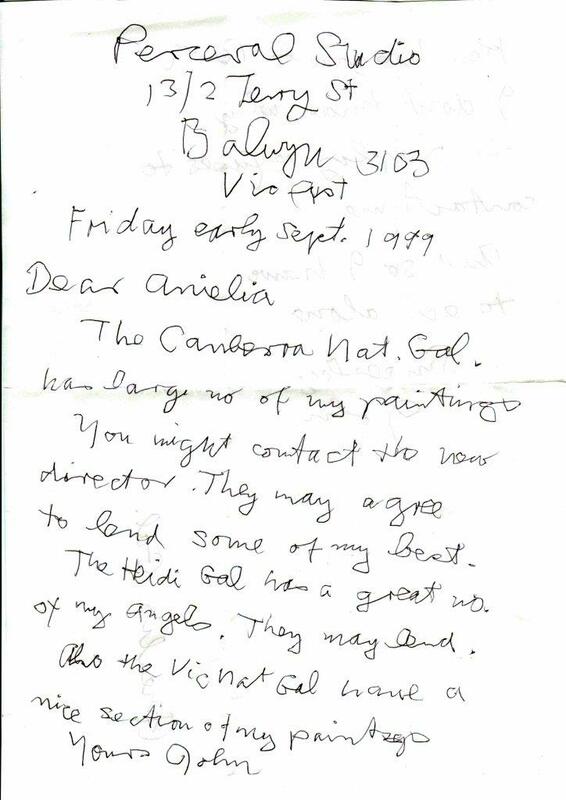 Other members included John and Sunday Reed, Joy Hester, Sidney Nolan, Arthur Boyd and Albert Tucker. 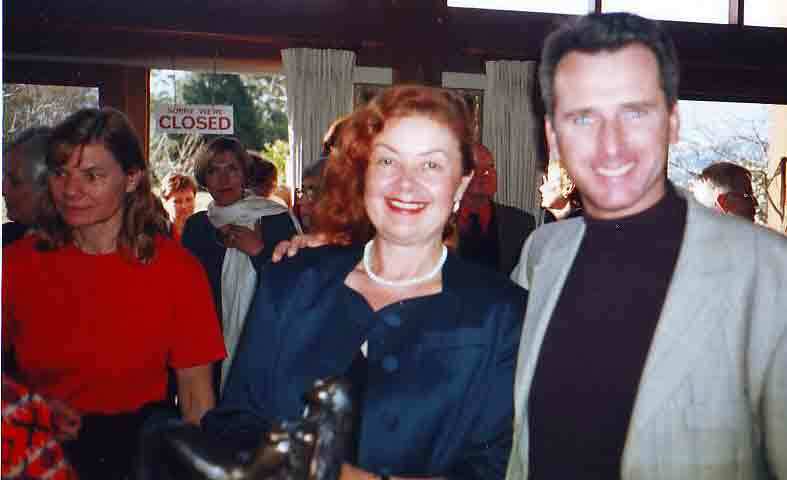 He was born Linwood Robert Steven South at Bruce Rock, Western Australia, the second child of Robert South (a wheat farmer) and Dorothy née Dolton. 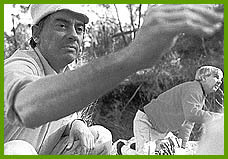 His parents separated in 1925 and he remained at his father’s farm until reunited with his mother in Melbourne in 1935. Following the marriage of his mother to William de Burgh Perceval, he changed his name to John and adopted the surname de Burgh Perceval. John Perceval moved to Melbourne with his mother in 1934 attending a local boarding school, Trinity Grammar, here he had his first access to a large library, where the school’s collection of art books left a profound impact on the teenager. 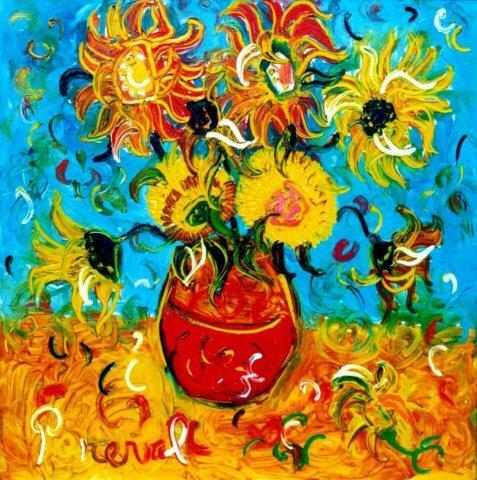 Greatly influenced by Van Gogh’s famous painting of the same title, Perceval’s first work Sunflowers (1935) captures the essence of Van Gogh’s work but Perceval’s own flair can be seen in its depth and unique textural qualities. In 1938 Perceval contracted polio and was hospitalised, giving him the opportunity to further his skills at drawing and painting. When he contracted polio and was confined to a hospital bed, Perceval spent much of this time developing his skills in drawing and painting. Although he survived the infection, it seriously affected his neck muscles, speech patterns and left him with a permanent limp. These problems continued to give Perceval constant troubles throughout his life. Enlisting in the army in 1941, following the outbreak of war in the Pacific, Perceval was assigned to the Army Survey Corps when he was rejected as unfit for military duty. In the army Perceval first met and befriended Arthur Boyd. During this time he used his drawing skills to become a draughtsman and soon met other young artists such as Albert Tucker, Sidney Nolan and Arthur Boyd. Becoming a close friend with Boyd, Perceval later met his sister, Mary whom he married in 1944. His associations with Boyd also allowed him to be introduced to the well-known art patrons John and Sunday Reed who helped establish his name within Australia’s art circles. After leaving the army and moving into the Boyd family home at Open Country, Murrumbeena, he married Boyd's younger sister Mary in 1944. Together he and Mary Boyd produced four children. From 1943, and the aftermath of the war, Perceval began to produce joyful religious and genre paintings with richly textured surfaces. Although he was exhibiting regularly with the Contemporary Art Society, Perceval held his first one-man show at the Melbourne Book Club in 1948. 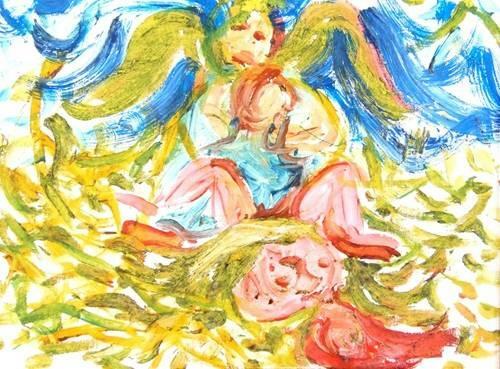 Establishing a pottery workshop at Murrumbeena with Arthur Boyd and Peter Herbst in 1944, between 1949 and 1955, Perceval turned to ceramic work and created a series of angel figures. Returning to painting in 1956, Perceval produced a series of spontaneous images depicting Williamstown, Gaffney’s Creek and a range of seascapes. Perceval held his first solo exhibition at the Melbourne Book Club in 1948 and showed regularly with the Contemporary Art Society. Between 1949 and 1955 he concentrated on producing earthenware ceramics and helped to establish the Arthur Merric Boyd Pottery in Murrumbeena. Returning to painting in 1956 Perceval produced a series of images of Williamstown and Gaffney's Creek. 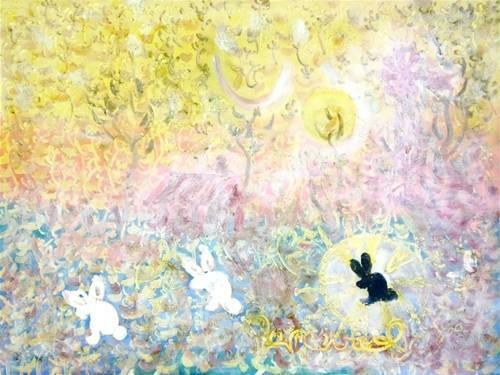 In 1959, Perceval became a member of the Antipodeans, a group of self-taught Australian painters who dramatically changed the local art scene in the 1940s and 50s. Working alongside Arthur Boyd, Albert Tucker, Sidney Nolan and Joy Hester, during his time as an Antipodean Perceval worked with passionate intensity to put his strong responses to nature onto canvas. Proving to be one his most creative periods, his palette and style had matured greatly to show subtle contrasts in tone and vibrant use of colour. In 1961 he began to receive wider recognition and was asked to contribute to the renowned Whitechapel Gallery’s 50 Australian Painters show in London. His work was also included in the 1962 Rebels and Precursors in Australia, London’s Tate Gallery in 1963 and later at Brazil’s Museum of Modern Art. Moving to England in 1963 Perceval held solo exhibitions in London, and travelled to Europe, before returning to Australia in 1965 to take up the first Australian National University Creative Fellowship ( Australian National University Creative Fellowship in Canberra) . John Perceval, a major retrospective exhibition, was held at Albert Hall, Canberra in 1966. Author Margaret Plant's monograph John Perceval, was published in 1971. However, despite his rising success, Perceval was tackling serious health problems. 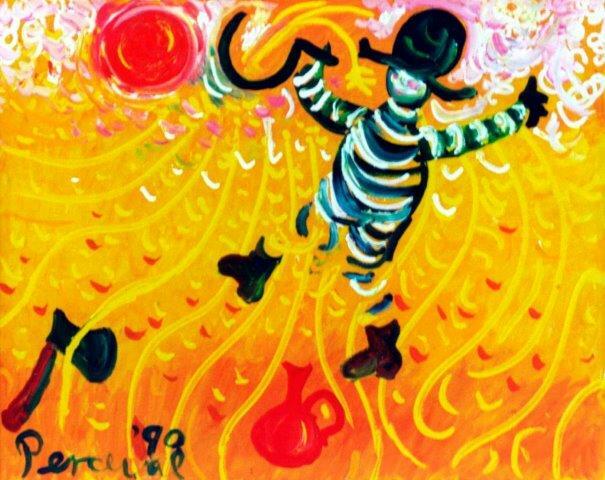 Suffering from alcoholism and schizophrenia in 1974 Perceval committed himself to the psychiatric hospital Larundel, Melbourne, where he spent nearly ten years of his life and remained until 1981. 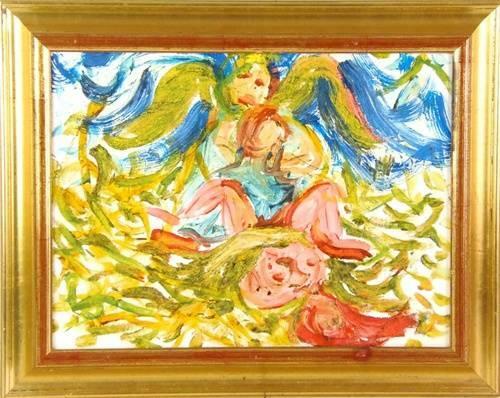 Perceval produced a small number of crayon sketches during this time and he did not seriously take up drawing and painting until 1987. Some of the images Perceval produced after his release from hospital reflect strong elements of tension and trauma. This can be seen in his works Jack-in-the-box with rooster lid (1987) and Feeding the Seagulls (1988) which include axe images and troubled expression. 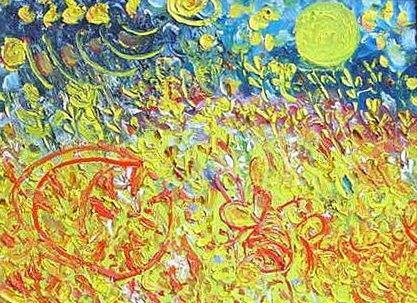 After Perceval left the hospital he again to begin producing jubilant and brilliant paintings with richly textured surfaces which brought him fame in the 50’s in his early artistic acclaim. 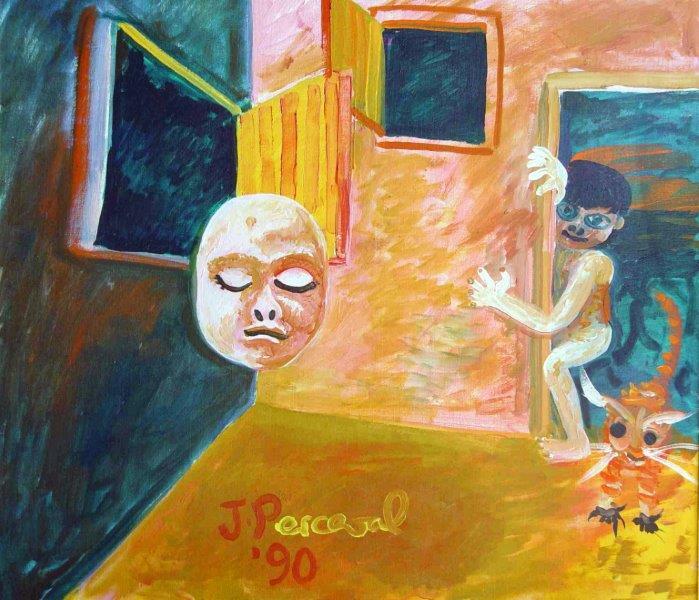 In 1984 John Perceval Retrospective Exhibition of Paintings was held at Heide Park and Art Gallery. 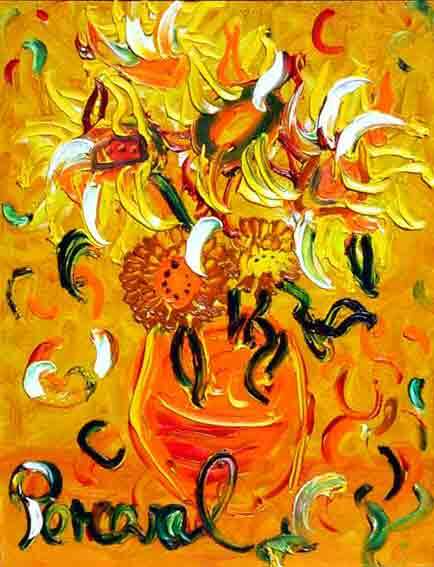 Perceval created the prestigious Sunflowers series and also continued his bellowed Williamstown series of paintings. 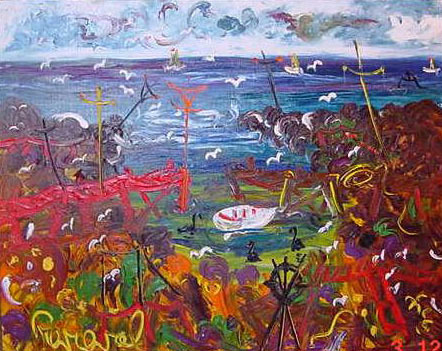 John Perceval established very strong emotional connection with Williamstown, a small Melbourne Harbour. Williamstown paintings formed Perceval first major show in 1956 bringing Perceval an immediate artistic acclaim and financial success. Perceval early Williamstown paintings are in the prestigious permanent collection of the National Gallery of Victoria (Melbourne) and the Heide Art Gallery, Victoria (John and Sunday Reed Collection) . 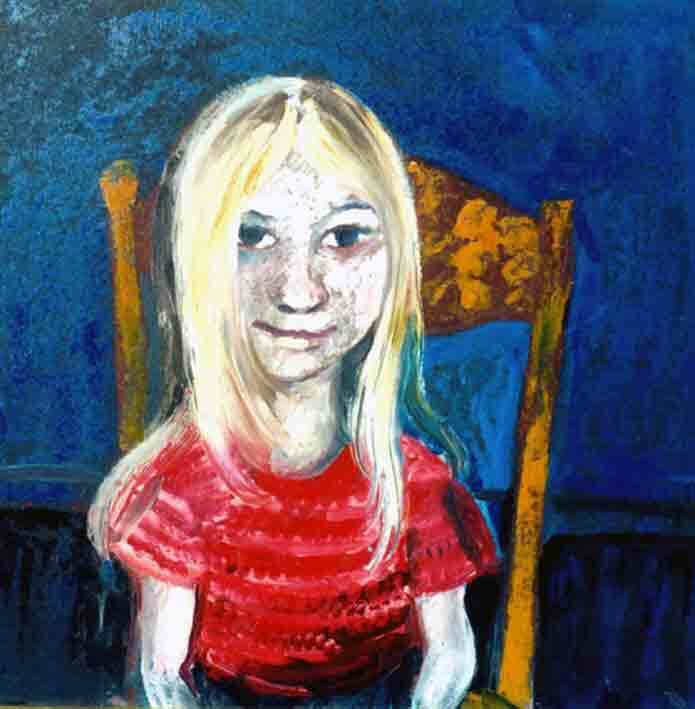 In 1990 National Gallery of Victoria organised John Perceval major Retrospective exhibition. In 1991 Perceval was awarded Officer of the Order of Australia (AO), it was the year after the National Gallery of Victoria organised John Perceval Retrospective. 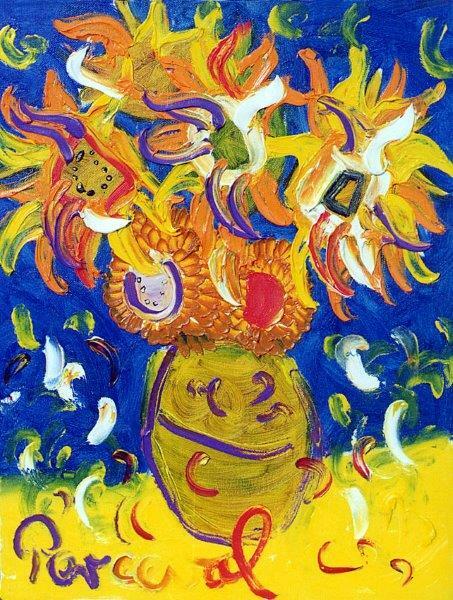 In 2000 JOHN PERCEVAL held his last major retrospective exhibition at Galeria Aniela officially opened by Justin Miller, Chairman Sotheby's Australia on Saturday, 19 August. The exhibition included 85 works, from as early as 1943, oil paintings, drawings, pastels and watercolours some works have not been previously seen. The exhibition held for 3 months was a fabulous success and canvassed by the ABC TV Australian National News. Perceval continued with his art until his death in 2000. As the last of the original core of the Antipodeans, his death was considered a great tragedy. 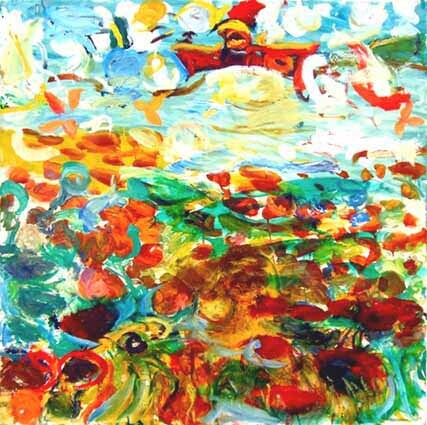 Prior to his death Scudding Swans (1959) sold for $552,500, a record for a living Australian painter. Perceval is survived by his four children, all of whom Celia Perceval, Tessa Perceval and Matthew Perceval are practicing artists today.